To celebrate the premiere of the final season of Game of Thrones, Brick at Blue Star is converting its space into a slice of Westeros for a show billed as “A Gallery of Ice and Fire.” The hybridized event will feature a selection of art both inspired by the original novels and the television show, as well as vendors, Game of Thrones-themed music and more. Brick is no stranger to hosting parties celebrating pop culture phenoms — past events include a Stranger Things art show and regular watch parties for The Walking Dead — but for the final season of Game of Thrones, it’s go big or go home. Enter John Picacio, a science fiction and fantasy artist extraordinaire who calls San Anto home. Back in the aughts, he caught up with George R.R. Martin himself and was given an offer he couldn’t refuse: the opportunity to draw up an official calendar based on the A Song of Ice and Fire book series. At the time, the books’ popularity was still relegated to the niche of genre readers — traded back and forth and discussed amongst other popular series like Robert Jordan’s The Wheel of Time, but it had not yet reached the widespread name-recognition that film adaptations had granted Frank Herbert’s Dune. That was soon to change, though, whether or not Martin believed it. He revealed to Picacio that he had signed a contract with HBO. “I was there on the phone with George after he signed that deal and he literally didn’t think this would come to pass, because he didn’t think TV was capable of doing it,” Picacio recalls. When Picacio’s 2012 calendar dropped, so had the first season of Game of Thrones, and his artwork popped off in a big way, riding the wave of viral fandom that the series had garnered. At the time, what neither fans nor Picacio realized was that his calendar art had its own, oblique connection to the show. 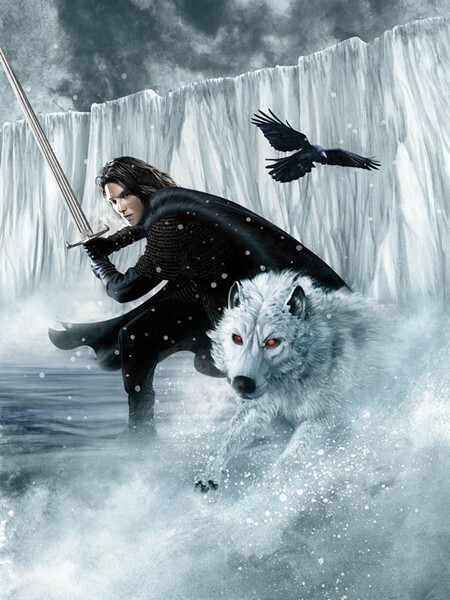 Picacio later learned from Game of Thrones’ producers that his artwork was used as a resource during pre-production for the first season, and Issac Hempstead Wright (Bran Stark) confirmed that Picacio’s portrait of Bran was hanging on the wall during the casting process for the character. 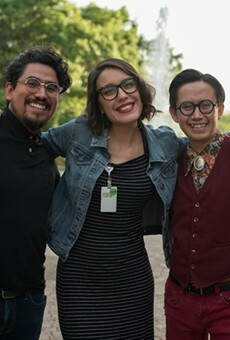 Seven seasons of groundbreaking television later, event coordinator Elaine Bretschneider knew she had no choice but to tap Picacio to compile a roster of artists for Brick’s blowout celebration of Game of Thrones’ final season. One of the big scores for the event is a piece by John Jude Palencar, whose artwork has graced the covers of everything from the Eragon series to a 2005 edition of The Lord of the Rings. 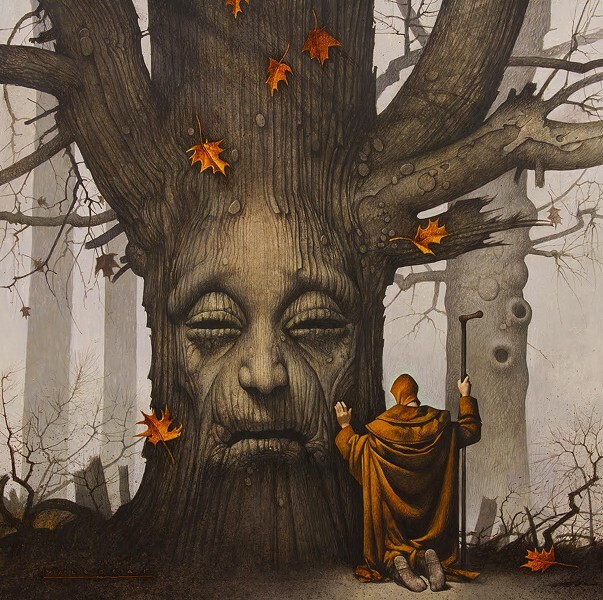 Palencar is the official artist for the 2019 A Song of Ice and Fire calendar, and Picacio has nabbed a print of his illustration of a supplicant at a Heart Tree, which captures a quiet, private moment in the world of Westeros — a far cry from the splashy visuals that usually come to mind when one thinks of Game of Thrones. 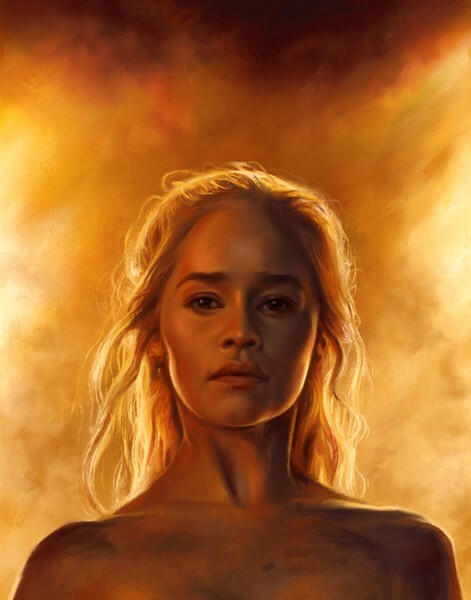 Also featured will be local artist Lauren Snow, who Picacio says will be “bigger than local in the not-too-distant future.” Her lifelike rendering of Emilia Clarke as Daenerys Targaryen emerging from an inferno is truly uncanny, capturing the power of a seminal moment in Dany’s development into the badass, dragon-riding queen we all know and love. Picacio will also have some of his own work on display, plus pieces from various artists including the “scary-talented” Tehani Farr and Instagram phenomenon Gary Villarreal, among others. With such hard-hitting talent on deck, this show isn’t going to simply be a collection of so-called “fan art.” While the visuals of the Game of Thrones series are nothing to shake a stick at, this event is about collecting “unique visions from a set of very unique artists,” giving Westeros-obsessed fans a broader view of Martin’s expansive world.